Abhi Ingle, Senior Vice President - Digital, Distribution and Channel Marketing, AT&T Business, will open the doors to one of AT&Ts premier innovation facilities to discuss current trends in Internet of Things (IoT) and Artificial Intelligence (AI). 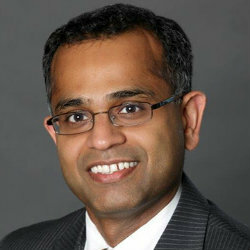 Abhi is a leading expert and frequent speaker in this area. IoT and AI are technologies that are changing the world. Today, virtually anything can be connected. From vehicles and home appliances to traffic lights and shipping containers, we’re connecting objects across nearly every industry. The demand for near real-time data is fueling the IoT growth that we are seeing among businesses. However, it is not just about collecting the data from connected assets, but extracting meaningful insights from them. AI holds the key to unlock the full potential of IoT. Being able to correlate data from thousands of sensors and end points can help companies across all industries improve processes, gain efficiencies, save money and enhance the customer experience. In many cases, AI can also predict future outcomes and create the potential for entirely new business models. Hear from Abhi how the combination of IoT and AI are shaping the future to transform how we live, work and play. After the presentation, take a tour of the Foundry and enjoy some refreshments and networking.